Mooring and offloading specialist, Offspring International (OIL), has announced an exclusive worldwide agency agreement with valve actuator and control systems supplier, Paladon Systems, for its innovative Autonomous Shutdown Valve for pipeline end manifolds (PLEM). The agreement strengthens OIL’s position as a leader in integrated CALM buoy and conventional buoy mooring and offloading systems. Conventional PLEM valve operation is usually controlled from the offloading buoy via a control umbilical, or a diver is deployed to manually open and close the valve. In the event the umbilical fails or the sea state is too high for divers, terminal offshore operations may be disrupted or the operator chooses to leave the PLEM valve in the open position, with potential pollution consequences. The Autonomous Shutdown Valve (ASV) is designed to remove the reliance on or eliminate the need for a surface control umbilical or diver intervention. 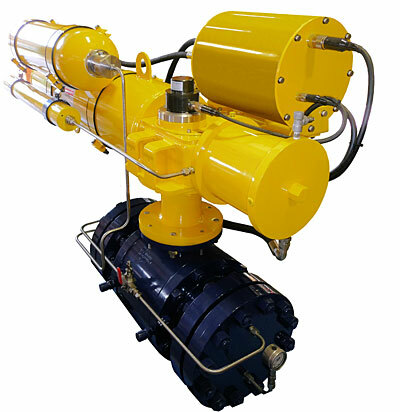 Suitable for both CALM buoy and conventional buoy mooring systems, the ASV is a self-contained subsea package comprising PLEM valve, spring-return actuator and long-life, battery control system. The actuator’s motive power comes from the pressure in the subsea pipeline, to open the valve. Once pumping operations are completed, the pipeline’s pressure drop enables the actuator spring to move the PLEM valve to the closed failsafe position. The valve closure speed can be controlled to suit the terminal. The ASV is designed to be inherently failsafe; and provides automated control of subsea valves for up to 7 years before requiring any servicing. In addition to operational benefits, the ASV reduces the environmental risks during oil terminal loading and offloading. In the event of a leak in the buoy riser and offloading hose, the loss in pressure automatically triggers valve closure, minimising the risk to the environment and tanker operations. Under the agreement with Paladon Systems, Offspring International is also able to draw on Paladon’s significant track record in conventional PLEM valve control by offering a range of PLEM valve control systems operated from the surface or from shore to oil terminals.